Rhyming Reels Hearts & Tarts is another game from Microgaming that is part of the Rhyming Reels collection. The theme of the game is based on traditional nursery rhymes and for that reason it somehow takes us back to some happier and careless times. So, we can see the Queen of Hearts on the reels together with the Knave and couple of waitresses. Rhyming Reels Hearts & Tarts is powered with only 2 special symbols, the wild and the scatter. The Hearts and Tarts logo is the wild and its only function is to substitute for all the other symbols on the reels except for the scatter to create winning combinations. The gleaming crown is the scatter and its function is to trigger the free spins. For landing 3 or more scatters you will receive 10 free spins. All the wins during the feature are doubled and if the Queen completes a winning combination than that win will be quadruple. Another great addition in this game is that the Queen symbols appear stacked and make it way easier to create a winning combination. Microgaming created Rhyming Reels Hearts & Tarts video slot game just to distract us from our every day troubles. The game is entertaining and offers some great wins on the way. Every player can find everything they are looking for in a game. There are special symbols and features that are activated quite often. And the stacked Queen symbols are just another reason you should consider playing this game. Different betting options will make both low rollers and high rollers satisfied, since they can find the perfect betting option for their bankroll. 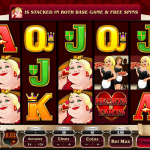 If you have not got a chance to play this slot before we would suggest you do. If you’d like to play a truly captivating game consider playing Silver Fang a 5 reel slot by MicroGaming.